We had the chance to try on the just announced Spartan Sport Wrist HR at the Salomon/Suunto booth. Featuring Suunto's intuitive new interface first seen in the Spartan Ultra which combines glove compatible buttons for in workout operation and a color touch screen for rapid access to the multitude of screens when used as a daily watch of during workouts. Wrist HR is Suunto's first... wrist based GPS/HR watch. Suunto partnered with Valancell, well known for its highly accurate optical heart rate sensing. 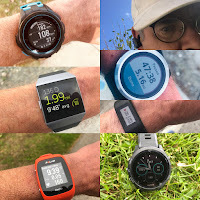 Suunto's testing indicates its accuracy will be within 5% of chest strap heart rate units. We look forward to testing it soon. The trail Sense Ride was featured by Salomon as the key shoe for fall 2017. And for good reason we think. 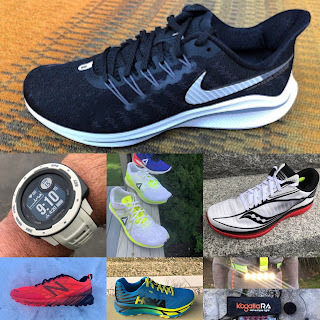 At 9.7 oz/275 g men's 9; 8.1 oz/230 g women's 8, well priced at $120 it is loaded with features and should become a stalwart trail runner for all sorts of terrain. Available Fall 2017. 12.8 oz/362 g. $200. Available Fall 2017. The Snowcross 2 takes the legendary Speedcross, water proofs it with ClimaSalomon membrane and adds a high top. We thought it was a more flexible and runnable winter alternative to the high mountain XA-Alpine (review here) with the added bonus of the waterproofing. It has an aggressive outsole for snow and mud. The Hybrid Fast Wing is a very light jacket which can be rolled down and stored in its soft elastic waist band which doubles as a pocket. The Sense Set gets 37.5 breathable and temperature regulating (captures and releases moisture vapor) fabrics along with a new closure systems. This women's only system is sure to also be show up on some dudes as well given its practicality. The cape is a very thin water proof material with a great hood. Combine any way you please: cape only, cape and vest, vest only.